I find that I am always out and about. Between work, classes, and running errands, I never have time at home. I decided to get an electric scooter to help me save some travel time, and I am so glad that I did. After researching which one is the best. so I decided to share some of them with you. Let’s take a look. This scooter has a sleek black exterior that is pleasant to look at. 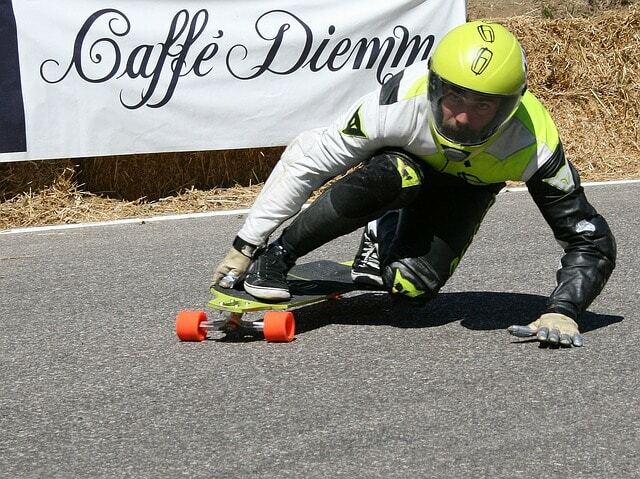 The deck is designed to provide a good amount of grip when you are riding, and the handles are a soft rubber that is easy on your hands. So that you never have to slow down when you are in a hurry, there is a pedestrian bell on the unit that can be used to signal. The scooter is also designed with a back reflector and a headlight that can make it easier to see and be seen when you need to travel after dark. If you need to carry the scooter instead of riding it, this unit has one of the best features that I have encountered. There is a foot pedal that is located at the front of the deck that you press to fold the scooter. Once it is folded, sit it on the back wheel and the handlebars to give you access to the handle that is located under the front wheel. 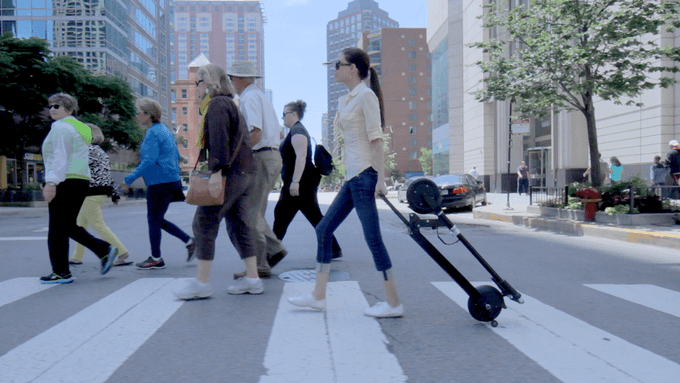 This scooter is a bit on the heavy side, but with the ability to pull the unit behind you like a suitcase, it becomes very easy to transport. I absolutely love the little trolley wheels that are located on each side of the back wheel. It allows you the ability to balance the scooter much more easily than you would be able to with only the back wheel. As I said, this is a scooter that is specifically designed for adults to use. 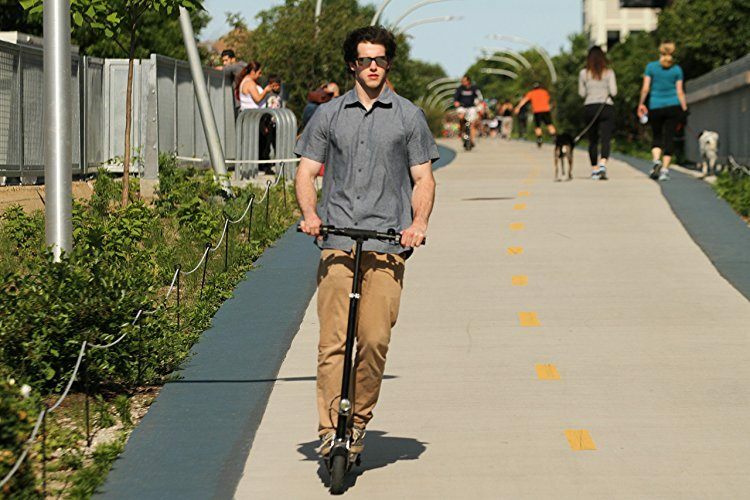 Many of the scooters on the market are designed for teens and adults, but this one is built to accommodate adult needs. In fact, it is able to accommodate a rider that weighs up to 225 pounds. Built for an adult means that it goes a bit faster than most scooters; in fact, this one moves at speeds of up to 15 miles per hour. It also comes with a charger that makes it easy to recharge while you are at work. Since it is likely that you will get caught in the rain at some point, the scooter also comes with a cover that is designed to protect it from the elements. The tires on this scooter feature an eight-inch honeycomb design that makes it easy to maneuver. In addition, the tires are designed to never go flat, so that is something that should never be a concern for your travels. The Li-ion battery is capable of providing a charge for 15 miles of travel, which means that you can get to where you need to go quickly. To enable the motor, you simply twist the handle on the right, and there is a handbrake that is located on the left so that you can control your deceleration. This scooter has a lot of great features that are not available on other models. You can ride this scooter after dark without being worried about visibility issues. It has a quiet motor that is great for the environment. The battery recharges in 3.5 hours of time. As an adult, you have needs for your commute. You may need a headlight, a cover from the rain, or a pedestrian bell to make your commute easier. 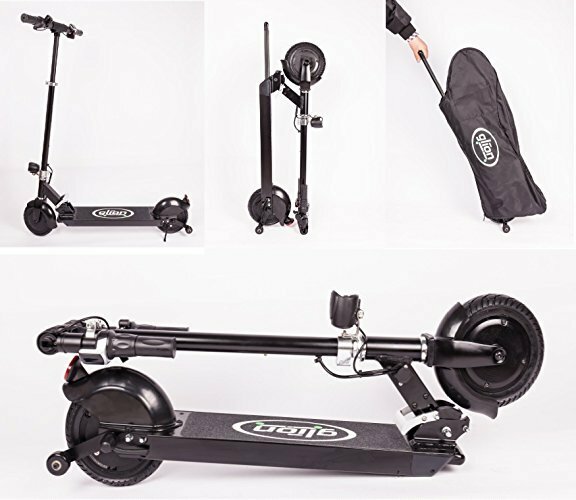 If you like the idea of a scooter that is designed for an adult to get from point A to point B quickly, then check this scooter out.